At Brød, we take great pride in our Danish roots. But we’re always happy to celebrate other cultures and tastes too - our recent fusion of Danish and Welsh traditions to create our own unique twist on products like the Wales Kringle spring to mind! Our drinks are no different, and when one of our baristas, Aga, originally from Poland, told us about her recent visit to Vietnam, we thought it would be the perfect opportunity to explore a new cultural mashup - and the potential to introduce Vietnamese Coffee to Brød. We spoke to Aga to find out more a little more about her trip. What took you to Vietnam? My husband first visited Vietnam six years ago and loved it. About a month ago, he took me there as a surprise for our honeymoon, and I thought it was such an amazing place - the people, the culture, the food and of course, the coffee. Why should we expect from Vietnamese Coffee at Brød? The coffee is sweet, with an incredible hazelnut and chocolate taste. It really is different and not many places in Cardiff serve Vietnamese coffee, so it’s a perfect excuse to try something new. I had my first Vietnamese coffee in Hoi An, in an amazing vegan and vegetarian restaurant, with a really friendly owner. I tried many coffees in many places, but that coffee really stayed in my memory because of the experience and atmosphere of the restaurant. We ended up buying our robusta coffee beans direct from the owner - it’s so special that you must go to her order it, and it cannot be ordered online. Vietnam is the world’s second highest exporter of coffee - almost all of which are robusta beans (compared to Brazil, the largest exporter, which is mainly arabica). As a result, robusta coffee is sold everywhere in Vietnam, from large commercial places to tiny cafes. A lot of people don’t know about robusta and often think it might be lower quality because the cost can often be lower in comparison - but this definitely isn’t the case for me, I just don’t want anything else! In Poland, my home country, we import around 50% robusta so I’m very used to that bean. We often mix the two beans - robusta and arabica - which is still nice, but I’m still a big fan of robusta on its own. There are also some health benefits to robusta - with its own natural sugar it doesn’t need chemicals added to it! 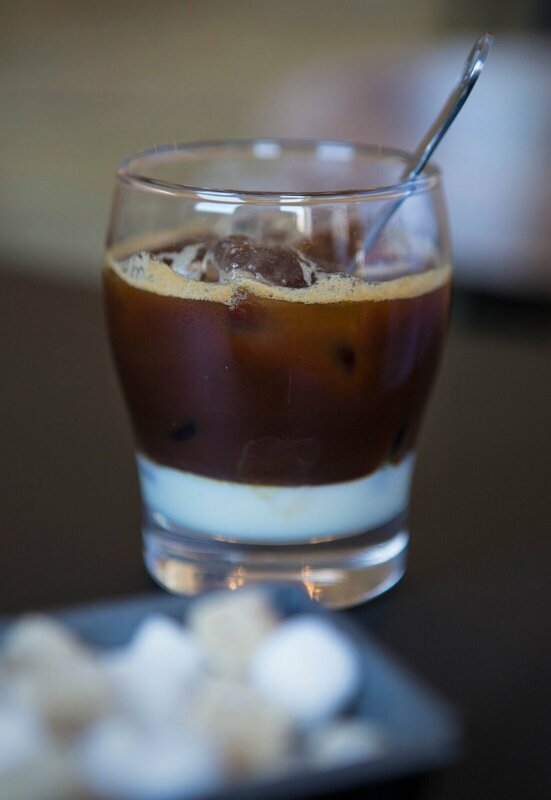 You can serve Vietnamese coffee hot or cold, but because of the hot weather in Vietnam, it’s mainly served cold and adding ice is fairly typical. We add condensed milk, and then drip the coffee over slowly using boiling water and a filter from Vietnam. We can then add the ice. So, a new taste experience for you to try at Brød. We hope you enjoy.